Last week, I reviewed the book BiblioCraft, wherein you’ll find a project I designed, inspired by ornamental penmanship of the 19th century. The project in the book is worked on a linen glass towel (like the one I used for this monogrammed towel). The one in the book was my second version of the project, though. I used three Au Ver a Soie silks: Soie d’Alger (makes a great satin stitch), Soie de Paris (the blues in the project), and Soie Perlee, along with a little bit of Trebizond. While I was working on the silk version, I had a nagging feeling that it didn’t “fit” the concept of the book very well. So I set up the redwork version on the linen towel to go along with it. The stitches on the silk version of the bird included satin stitch, long & short stitch, stem stitch, bullion knots, and seed stitch. 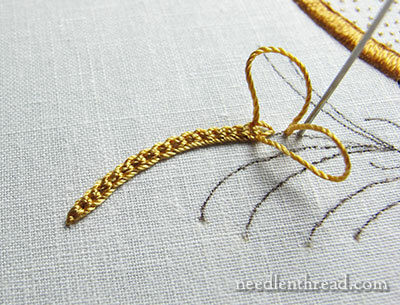 While working on the project, I discovered that Trebizond silk makes a glorious Hungarian braided chain stitch – though, in fact, I never actually used the Hungarian braided chain stitch in the final version of the project. I also discovered the Problem of the Antique Frame. Finding a frame for the bird was not easy. I wanted something that looked antique – that reflected the origins of the design in an era when ornamental penmanship flourished. I found an antique oval frame with domed glass through an antique shop, the idea of which suited the project really well. The dimensions seemed right, but in fact, once I put the frame over the embroidery, they weren’t right. The frame was slightly too big. So I cut an oval mat in gold, matching the gold trim on the frame, to fit just inside the frame and bring it in a little closer to the embroidery. With antique frames, cutting an oval mat from “automatic oval sizes” available today is useless. Old frames were not necessarily made with absolute computer precision. Cutting the mounting board for the embroidery so that it would fit in the frame was also a headache. While I started with an oval, the nature of the frame demanded that I keep trimming a little here, a little there, to make the mounting board somehow fit into the frame. And this, of course, made centering the embroidery more difficult, too. Another problem I ran into with the antique frame was incessant crumbling. While the front looked ok – just a little antique-ish and worn, but still solid – the wood behind crumbled. Little bits of crumble, here and there, constantly fell from the frame, peppering the fabric and embroidery. So I learned a valuable lesson (at the zero hour, no less). Skip the antique frame, unless you know for certain what it will do for you. Incidentally, since then, I’ve discovered several sources for new frames with domed (or bubble) glass, which I think is an interesting option for framing embroidery. 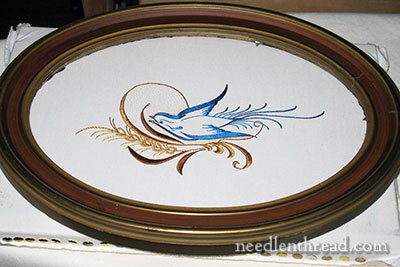 Eventually, I’ll reframe the silk version of the penmanship bird in a new frame. As it turned out, the redwork version was chosen for the book, as I figured it would be – it is less complicated and fits the nature of the book better. So that was the tale of the Penmanship Bird Project! It was a good learning experience for me. But then, just about every project turns out to be a good learning experience in some way, don’t you think? Good morning, Mrs. Corbet. I think that when I get up the courage (and funds) to use silk threads I’ll choose this sweet little bird as my first try! Of course, I’ll be trembling the entire time, but it’d be worth it. I like both versions of this project, but the blue bird reminds me of “Zip-A-Dee-Do-Da” and Louis Armstrong always wins! Thank you for sharing! Yes, that’s what it reminds me of, too!! Oh what a tale of the penmanship Bird Project, it just goes the show that antique is not always the best, so frustrating. 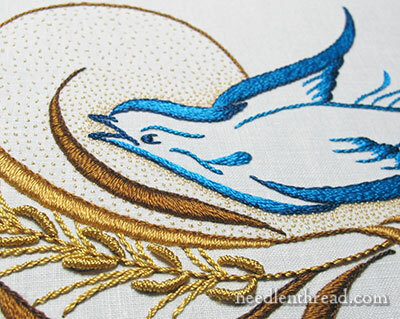 But the embroidery is beautiful I love the bird and the corn, it looks so simple but elegant. Is this the picture you partly showed a while ago but couldn’t show us all because it was for a book? thanks for sharing this with us and the tips on not what to buy for framing. Hi, Anita – yes, that’s the project. A year and a half ago, would you believe it?! thanks for your reply, wow how time flies! Intriguing – I seem to remember the previous pictures. Working from Mary’s “year and a half” and looking back through post titles from September 2013 through December 2013, I couldn’t find them. I would really appreciate a referennce. Hi, Helen – this is the book: https://www.needlenthread.com/2014/03/bibliocraft-combining-two-worthwhile-concepts-in-one-book.html And this is the previous article: https://www.needlenthread.com/2012/12/project-progress-seed-stitch-goldwork.html – it was 2012, actually! Mary, would you mind sharing those newer “bubble glass” frame makers/dealers? I think they may be something I would be very interested in with what I am starting to do with my work. Thanks. Forgot to check the notify box. Like I said, no memory. Hahaha! So pretty and graceful!! I love the seed stitch!! Mary, Your attention to detail is amazing, your style, classic. Love the blue bird. Love the blend of blues. Well, as I sit unpicking a passion flower done in split stitch, opting for laid gold thread, I am thinking of you. You spoke of the nagging feeling and boy did I have that. Many thanks for all your encouragement for the stitchers in this world. Mary, you are being a tease again. Where did you locate the domed glass frames? The bird in silk is absolutely gorgeous. I love your color choices. I also forgot to check the followup box. The red one is good too. Worked in the one colour, it looks more like a signature as from a pen. But I love the beautiful flourishes of penmanship in any colour! Could you please tell us the needle size you used, and the thread colour of the Trebizond silk in the Hungarian Braided Chain Stitch. It looks the perfect colour for wheat. Thank you Mary! Mary, I so agree! All projects, even if they are something we’ve done before, teach us new things. I’m so glad you’ve written about your alternate project for Bibliocraft as I was curious to see it. Elegant and lovely!